The Man With No Name Accused of Cultural Appropriation! A white man should not wear a poncho! 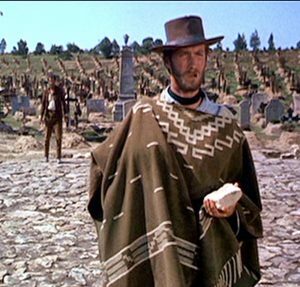 The man with no name, the bounty hunter sometimes called “Blondie” has been asked to removed his poncho and give it back to the Mexican people. “White men should not wear ponchos” said a spokesman for the People for the Ethical Treatment of Mexicans. This is a white man. A bounty hunter. Like all white men he is a born killer. He kills because as a bounty hunter he is paid to kill. Typical of white people. Why can’t he wear what white people wear? Why must he defame an entire race, a race of color, by wearing a poncho? The poncho has a long and proud tradition among the Mexican peoples. If you see someone wearing a poncho do you say “Is he American?” No. You say “Poncho! He must be Mexican.” Indeed ponchos are the signature look of Mexicans. That and the guitars they carry to strum on the NYC subway to make a living. I ask that this man, Blondie, take his poncho off now and return it to the Mexican consulate in the New Mexico territory. It’s a question of social justice! Indeed the hashtag #makeblondieremovehisponcho has begun trending on Twitter. Many Hollywood celebrities have joined the campaign to make Blondie take off his signature Mexican outfit. “All white men should be rounded up and raped” said Joy Behar on The View. As a black woman I know a thing or two about cultural appropriation. Look at all the things the white man has stolen from us: The Pyramids, which were built by the black man. The Bible, which was inspired by African culture. And lets not forget Jews! I am a Jew. The Jews of the Bible were from sub-Saharan Africa! That is a fact. Look it up. As a person of color I call on Congress to protect the Mexican people and their cultural artifacts. If we have to we should segregate Mexicans into some sort of cultural ghetto where they will never again fear the white man stealing their ponchos! Mexican President Enrique Pena Nieto has announced a ban on cross-border poncho trade. First the Yankees steal Texas. Then they steal California. Now they are stealing our ponchos. Reconquista! Reconquista our ponchos! We Mexicans care deeply about this. That and not being executed by drug gangs. No one knows exactly what he means by this but some suspect that the digging reference is in itself culturally appropriating the work of gravediggers. Notice how the cisgender racist oppressor threatens with his “gun.” We have to go to war with Russia. Everyone agrees we must go to war with Russia. The only difference is some believe we should go to war before impeaching Trump while some believe we should only go to war after impeaching him. In a live interview on last night’s Butchie”Madcow” Maddow show Presidente Nieto (Nieto means grandson in the language of the border crossers) pledged to take back the Bronx from the Dominicans.